The new planets cannot yet be seen directly, but Spitzer's Infrared Spectrograph (IRS) instrument clearly showed that an area of dust surrounding certain stars was missing, strongly suggesting the presence of a planet around each. The dust in a protoplanetary disk is hotter in the center near the star, and so radiates most of its light at shorter wavelengths than the cooler outer reaches of the disk. The IRS Disks team found that there was an abrupt deficit of light radiating at all short infrared wavelengths, strongly suggesting that the central part of the disk was absent. These stars are very young by stellar standards, about a million years old, still surrounded by their embryonic gas disks. The only viable explanation for the absence of gas that could occur during the short lifetime of the star is that a planet--most likely a gas giant like our Jupiter--is orbiting the star and gravitationally "sweeping out" the gas within that distance of the star. GM Aurigae has 1.05 times the mass of our Sun-a near twin--so it will develop into a star very similar to the Sun. If it were overlaid onto our own Solar System, the discovered gap would extend roughly from the orbit of Jupiter (460 million miles) to the orbit of Uranus (1.7 billion miles). This is the same range in which the gas-giant planets in our own system appear. 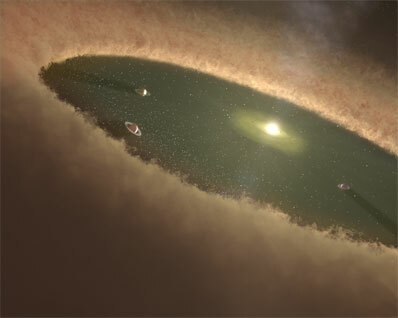 Small non-gas-giant planets, rocky worlds like Earth, would not sweep up as much material, and so would not be detectable from an absence of dust.